Whether you are throwing a party or attending one to celebrate the New Year, it’s always good to start off the year with a few delicious appetizers, like these incredibly easy Hasselback Baby Potatoes. During this years’ Christmas party, I made a batch Hasselback Potatoes for the first time using baby sized spuds. I barely had time after they came out of the oven to sneak a pic or 2 because they were gobbled up, right away. Needless to say, I just had to make them again then again until finally, no one was around to eat them (except me and I may or may not have eaten 1 right out of the pan). I tell you this because these little munchies made everyone happy! Hubby, kiddos, guests…really everyone. Because I only share the “hits” not “misses”, I was determined to get this recipe with you before New Years Eve. Then I realized…tomorrow is NYE!!! WOW. SO in order to get this out in a timely manner, this is going to be short and sweet. Sorry…. 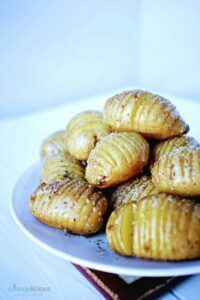 no long stories, no wordy explanations, just pictures and this Hasselback Baby Potato recipe. You have parties to get to anyways, right? start with scrubbed baby potatoes. Use chopsticks to create a stopping point for your knife as you make multiple slices through the potato. Generously drizzle with olive oil or melted coconut oil then sprinkle with salt and pepper. Preheat oven to 350°. Wash & scrub potatoes. Blot dry. Place 2 chopsticks on the cutting board parallel to one another and place potato in between them. 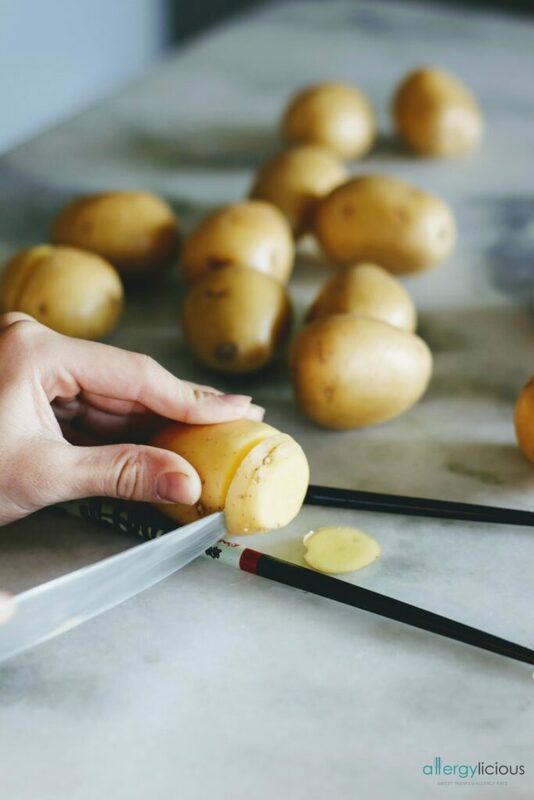 Using a sharp knife, start making small slits into potato, using the chopsticks as your guide on where to stop cutting (you do not want to cut all the way through). Repeat with remaining potatoes and place all in a large bowl. Drizzle with EVO or coconut oil, making sure to toss so every inch is covered. Then sprinkle with a generous amount of salt and pepper. Don't be scared! Potatoes are quite bland and these babies can use a little salt! 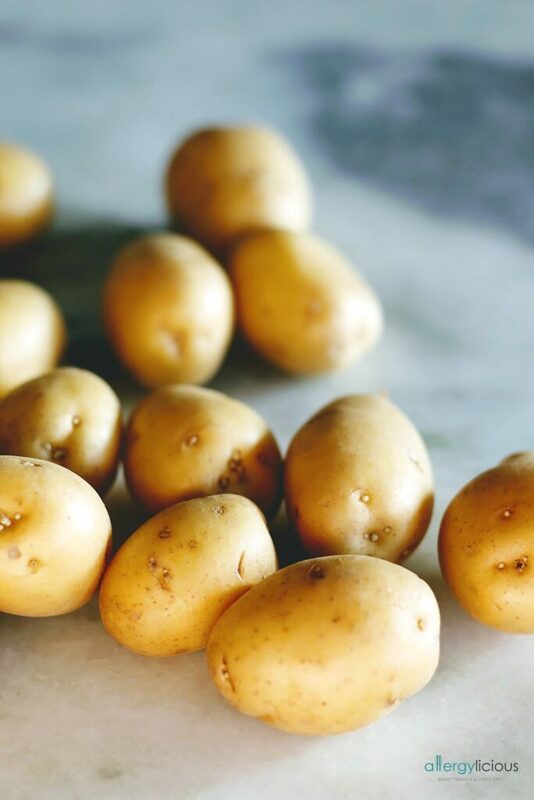 Place prepared potatoes into a rectangle baking dish and place in oven. 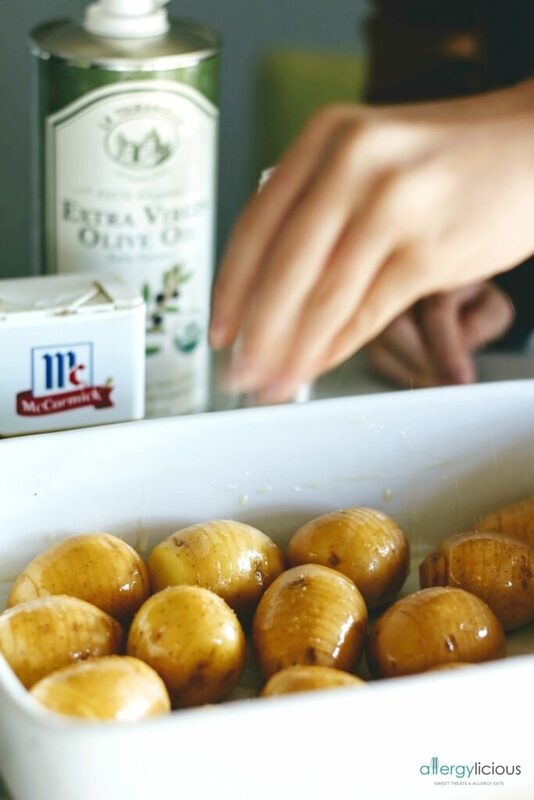 Bake 30 minutes, remove from oven and drizzle with a little more oil so it can seep into the soft parts of the potato. Cook an additional 20-30 minutes or until lightly browned and soft in the middle. Remove from oven and serve warm. Enjoy these as you would any baked potato. You can eat them as is. Dip each bite into your favorite "safe" ranch or sour cream dip. OR....sprinkle with shredded cheese and jalapeños in those final moments. 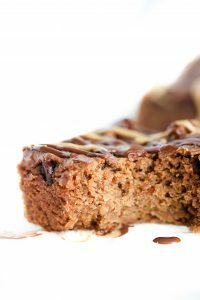 Your friends will want this recipe, trust me! It’s so easy to make and its also easy to give it your own little spin. I like it plain and simple but just think of the possibilities. Jalapeños inserted into several of the potato slices then topped with cheese in those final moments. Or how about all the different sauces and dips you can dunk these little munchies into? I’m thinking vegan ranch dressing, sour cream, or your homemade “safe” cheese sauce….yum! Now that’s a party. What are you planning on making or bringing to celebrate the New Year? Is there a family tradition? I tried making hasselback baby potatoes once and it was a mini disaster! I’ll have to trial your instructions as these look perfect! I think I may have cut mine too wide. I love hasselback potatoes! I’ve never thought to make therewith baby potatoes before. They’re almost too cute to eat! 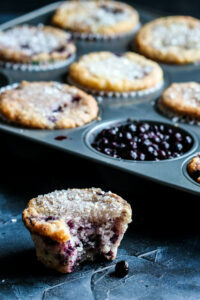 Dianne, I made them a few times with regular baking potatoes but these are our favorite. You can’t fill them up as much but they are perfect for dipping. Oh yum! What a great idea using baby potatoes! I would have grabbed one straight from the pan too! They look totally scrumptious! Like “I bet you can’t eat just one” type of deal! LOVE the chopsticks idea! These are so cute! I will definitely have to try this recipe out! Little bite-sized apps are just so much cuter, aren’t they? I think the small size makes the flavor even more bold too. 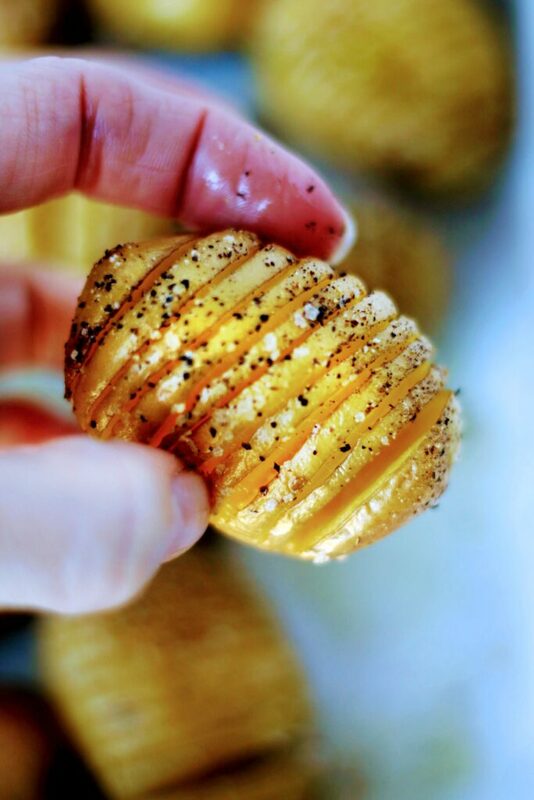 I need to make hasselback potatoes! These look delicious! Ceara, I don’t think you’ll be disappointed. I keep thinking about ways I can make them more often. I LOVE potatoes! All ways all kinds. These look delicious! Thanks Sophia! We’re big potato lovers here too! You had me at potatoes. I could live on them alone! I have never made hasselbacks though. I need to have a go! I know, I just love potatoes too! You’ll have to try these for sure. My kids are already asking me to make more. I think I eat potatoes more than any other food out there and these would be gobbled up in my household in seconds as well! They look so good and beautiful as well! And brilliant idea about the chopsticks!! We eat a ton of potatoes as well, I don’t know how anyone would want to give them up 🙂 Hope you get a chance to try them. 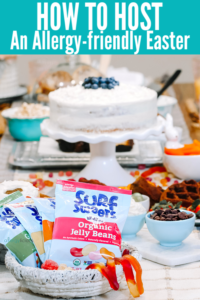 Super easy and even more delicious.